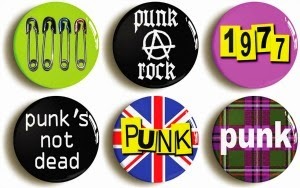 Punk rock started around the mid 1970s and developed into many different styles as the 80s approached. It was not only the music that was anti-establishment, but the clothing, too. Tartan was popular with the upper classes and punks wore it to rebel against them, along with offensive T-shirts, ripped clothing, leather jackets, safety pins, spiked and studded jewellery etc. 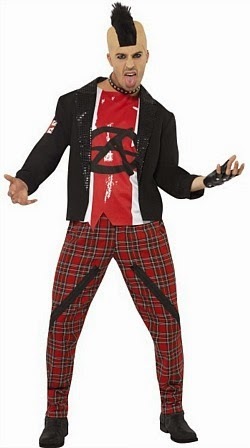 Punk fashion is a fun fancy dress idea and this anarchist outfit includes a jacket, top and tartan trousers. As with most fancy dress costumes the accessories are not included, allowing you to accessorize the outfit however you desire. Here are some suggestions. 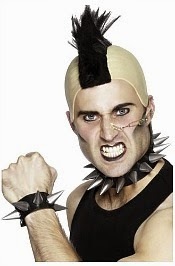 The link above will take you to a whole array of accessories (including studded and spiked chokers, wristbands and gloves etc) from the many suppliers at Amazon.co.uk. These pin badges are a fun idea and will add the finishing touch to your costume. 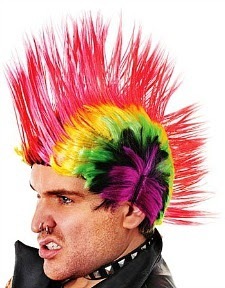 One of the most popular and best-remembered punk hairstyles was the mohican or mohawk. If you want to turn heads with your costume then this colourful wig should do the trick. At under £5 (as I write) the price is very competitive and this wig would look fantastic with the anarchist costume.